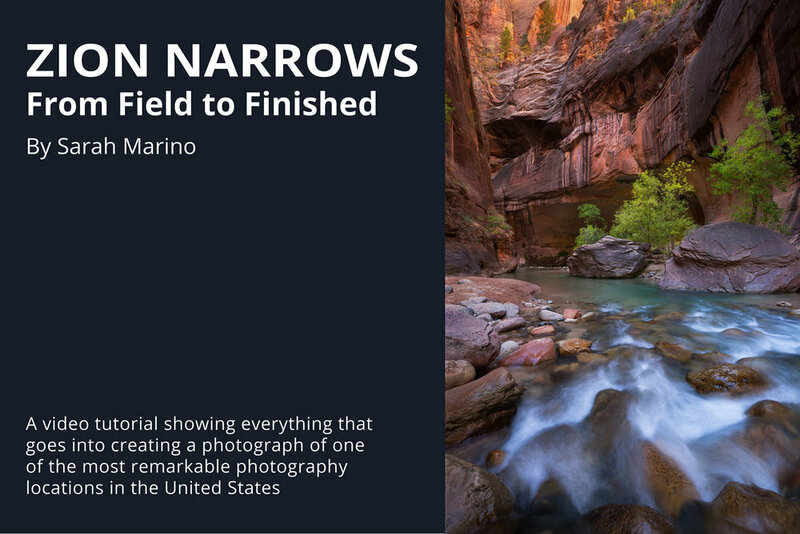 Zion Narrows: From Field to Finished is a 52-minute video tutorial showing everything that goes into creating a photo from one of the US’s most remarkable photography locations. About photographing in a challenging environment like the Zion Narrows, including essential gear and other preparations. How to photograph moving water, including technical and creative choices to improve your results. Working through compositions in the field and then assessing your options when you are ready to select a photo for processing. Technical decisions, including aperture, shutter speed, ISO, and focusing. Processing techniques that enhance the photo while still keeping it grounded in reality. This video includes a start-to-finish example of processing the photograph using Adobe Lightroom alone, plus an overview of processing steps using Adobe Lightroom and Adobe Photoshop combined. Photo processing topics include processing a RAW file; adjusting exposure, contrast, and colors; emphasizing and de-emphasizing elements with a photo; and using processing techniques to optimize a composition. The Photoshop video also includes basic examples of using luminosity masks and an easy exposure blend. 52 minutes of video-based instruction, split into three videos (field practices, processing the photo using Lightroom only, and processing the photo using Lightroom + Photoshop). 2 practice files to help follow along with the processing tutorials (a small unprocessed JPEG file for the Lightroom only video and a small layered TIFF file for the Lightroom + Photoshop video). This video is intended for beginning to intermediate nature photographers. An understanding of key processing tools in Lightroom will help you get the most out of the Lightroom video. An understanding of key tools in Photoshop will help you get the most out of the Lightroom + Photoshop video.